Today in our adult Sunday School Class, I shared a 3.5 minute narrated slideshow titled, “My Gospel Encounter with Bob Sprankle.” I created this video after writing a 9 part, short script and collecting old photos of Bob and I. I combined these on my iPad using the free app Adobe Spark Video, as described in my book chapter on “Narrated Slideshows” in Pocket Share Jesus. Building on the four part framework for sharing your story / sharing your testimony that our church staff wrote back in August in the post, “Going Deeper Into Your Story,” I am encouraging members of our Sunday School class to use this model to frame their stories of “everyday Gospel encounters” as well as “bigger” stories, like our testimonies of how we came to faith in Jesus Christ. We used Psalm 71:15-18 as our focus verse today, recognizing how God calls us to witness to others about his acts and powerful works in our lives. This is a verse I’ve included on the “Why” page of the dw4jc.com website. 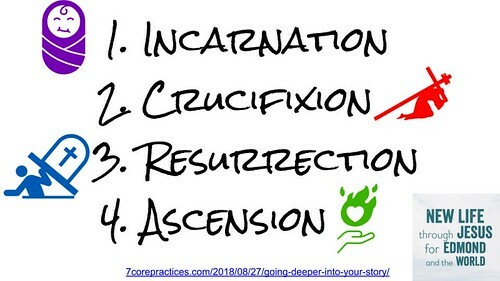 In “Going Deeper Into Your Story,” we are encouraged to use a four part framework for composing and sharing our Gospel encounters with Jesus: Incarnation, Crucifixion, Resurrection, and Ascension. Each of these phases are explained in the post. It can be challenging to know how to share our stories of faith, and this framework can be very helpful as a “template” we can use to fill in our background and the significant events in our story which we want to share with others in a concise, effective way that points primarily to Jesus, God, and the work of the Holy Spirit. I definitely like and have used this four part framework, but the second element, “crucifixion,” suggests that this model is only focused on stories about the darkest and deepest valleys of our lives when God intervened. Those are stories we may be called to share, but there are also important Gospel encounters which may not fit under the dramatic category, “crucifixion.” For that reason, today I suggested also thinking about and praying about Gospel encounters in our lives we can share which are more everyday events. God is at work all around us, all the time. Our busy lives and full schedules can be impediments to our ability to discern and “see” God’s work in our week. 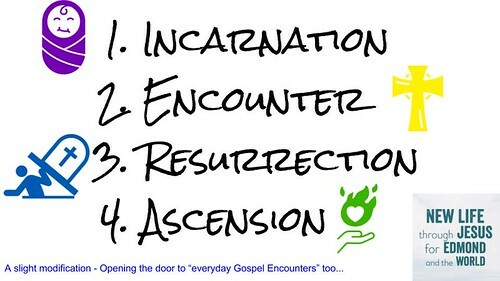 With this in mind, I substituted the word “crucifixion” with “encounter” in this four part framework. Brainstorm your topic and story. Script: Write your story in chronological order, keeping in mind Adobe Spark Video limits you to 30 seconds of narration per slide. This is likely the most challenging and time consuming step of this workflow. Find Photos: Either locate photos you have taken and save them to the device you’re using to create the digital story. In my case, this was the Photo Roll of my iPad. If you don’t have photos, Adobe Spark Video lets you search for icons from The Noun Project. You can alternatively find copyright-friendly images from websites like Unsplash. Insert these photos into Adobe Spark Video. 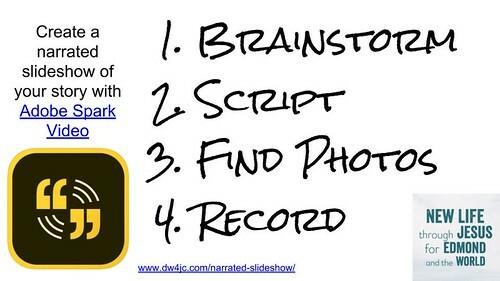 Record: Find a quiet spot and record the audio narration for each slide of your story. Then export your final video and upload to YouTube for sharing via social media, email, a website, etc. After watching my example narrated slideshow about my friend, Bob, I asked class members to respond. 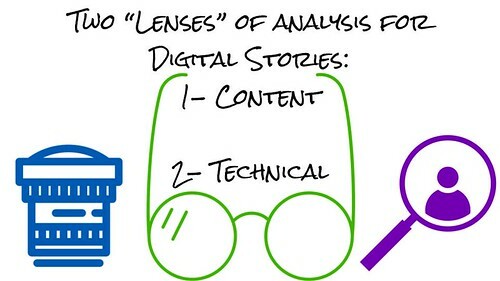 We used “the two lenses of analysis” for digital storytelling which I learned about presenting lots of workshops from 2006 to 2009 for Storychasers. These lenses are “content,” when you focus on elements of the story, and “technical,” when you focus on technology details and process elements. Our closing challenge in today’s lesson was to think about Gospel encounters we can share in the weeks and months ahead, either in person or as short, narrated slideshow videos. I’m hopeful I’ll be able to offer a Saturday morning workshop in February or March this year on the process I modeled and explained today using Adobe Spark Video. Here are the slides we used in today’s lesson. If you find these ideas helpful, have questions or feedback, please reach out to me via Twitter (@wfryer) or my electronic contact form, which will send me your message via email. I pray God will empower you to be bold and courageous as you share your stories of faith, walking with Jesus Christ.